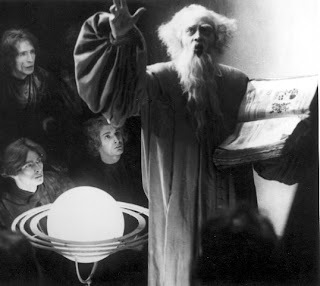 Though there is some controversy as to whether Faust effectively conveyed the significant motifs inherent in its subject matter, the technical virtuosity of the film is unquestionable. Gerhart Hauptmann, Germany’s foremost poet at the time, even composed the film titles. Eisner sounds almost reverent when declaring that the “chaotic density of the opening shots, the light dawning in the mists, the rays beaming through the opaque air, and the visual fugue which diapasons round the heavens, are breathtaking.” No other director, not even Lang, ever succeeded in conjuring up the supernatural as masterfully as this. Whereas Lang attempt to give faithful reproduction of the famous paintings he sometimes uses, Murnau, who was trained as an art historian, elaborates the memory he h as kept of them and transforms th em into personal visions. Perhaps Murnau’s homosexuality made him feel the terror and vulnerability of existence more forcefully, but, in any even, all his films bear witness to a complex inner struggle he waged in an alien world. In the two years since his The Last Laugh (1924), Murnau had tempered his use of the moving camera to subordinate it to the overall rhythm of the film. 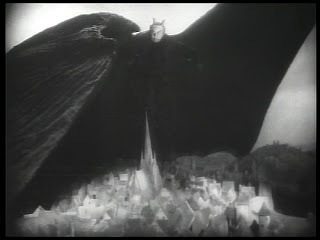 An indirect sense of fatality is given to the viewer by Murnau’s technique of shooting Faust and Gretchen as if from the eyes of Mephisto. The invisibility of Mephisto renders his presence more ominous and the plight of the protagonists more hopeless. One might have hoped, however, that Murnau had been able to restrain the fatuous overacting of Jannings as Mephisto. As in other Murnau films, the casual viewer might find Faust static and ornamentally heavy because of slow camera rhythm, but the fluidity and expressive beauty of the film is there for anyone who chooses to look.